9ct gold chain with amethyst drop. Condition is Used. Dispatched with Royal Mail 1st Class Large Letter. Beautiful 9ct Yellow Gold Fancy Sapphire and Diamond Necklace. Sapphire Weight 8.043 cts Size 34 x 4mm x 3mm. Diamond Weight 0.340ct Size 68 x 1mm. Gold Weight 15.60 grams. New deep blue topaz and solitaire diamond and white gold pendant necklace, with snake chain in 9 carat white gold. Hallmarked 375. 18KT WHITE GOLD ENGLISH HALL MARKED, 10, 2mm ROUND RUBYS, 1 ,2mm DIAMOND TOTAL WEIGHT. 1THIRD,CT CHAIN IS 18". THIS IS SOLID GOLD NOT PLATED TOTAL WEIGHT CROSS AND CHAIN 3.84 GRAMS WITHOUT STONES. Metal: White GoldStyle: ChainLength: 18 - 19.99"
9ct Gold Blue topaz and Diamond Necklace. Pretty 9ct yellow gold blue topaz and diamond necklace. Length is 18.25". The necklace has a full 9ct gold hallmark. Beautiful Created Ruby and Diamond Heart Displayed in Real 9ct Gold (not plated). Pendant Size 16 x 11 mm. Presentation Box Ready For Gifting. Delicate pink sapphires and brilliant cut diamonds set to perfection into a sterling silver heart attractively attached to a sterling silver T-Bar chain. Excellent Condition! Metal: Sterling SilverStyle: ChainLength: 18 - 19.99"
This item is boxed as new. part of the Bellissima 925 Sterling Collection. 15"Sterling Chain. Style: ChainLength: 13 - 15.99"
This item is used and has plenty of life left, may have surface scratches. Black display is not included. 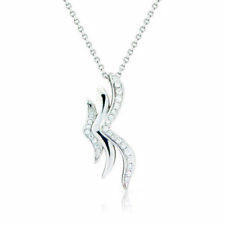 Here we have a gorgeous sterling silver butterfly necklace set with stunning diamond. This necklace features 5 butterflies, 3 with a cutout design and two solid ones, the largest butterfly features 1 natural diamond. PHOTOS AND DETAILS TO FOLLOW. Metal: Yellow GoldStyle: ChainLength: 16 - 17.99"
They are hallmarked. In a immaculate condition. This item is used and has plenty of life left and could do with a clean. Black display is not included. We try to provide boxes to suit the item. THIS IS SAFE QUICK AND EASY. ON THE LEFT SIDE OF ALL OUR PAGES SHOWS OUR LIST OF CATEGORIES. AND TO SAVE YOU MONEY. All our goods are genuine as described. 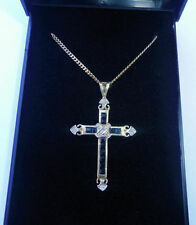 Sterling Silver Diamond Cut Belcher Chain Necklace 16" 18" 20" 22" 24"
925 Sterling Silver Sapphire & Diamond Cross and Chain. An elegant silver cross and chain withe cross having four sapphire gemstones and two diamonds. The size of the cross is 2.4 cms long x 2.0 cms wide and with the chain has a total weight of 4.7 grams. Hallmarks: Birmingham assay office 9ct gold 375 stamped to the bail of the pendant. Length including chain: 25cm. Possibly Carissima Gold Collection but maker's mark is rubbed. Length of Cross: 18mm. Width of Cross: 15mm. 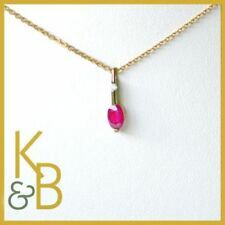 NEW 9ct Yellow Gold 16" (41cm) Anchor Link Chain with Ruby Droplet with Diamond Pendant - RRP £187. (Our Code: 4175). It's all UK hallmarked and you are unlikely to have the opportunity of buying this quality of jewellery at this price again. 925 parts per 1000. One of TJC’s founding principles is to do the right thing and our One for One charity ensures we do just that! Fashion Accessories. Sterling Silver. One for One. We follow catwalk styles to make sure we can bring you the latest fashions. 9ct amethyst peardrop on a 9 ct yellow gold rope chain 18"long.1mm diamond. 14ct Yellow Gold, Amethyst & Diamond Cross & 21 Inch Chain. Both Hallmarked & Tested as 14ct Gold. Cross Measures 52.30mm x 29.67mm. Total Weight 7.63gr. Comes in Box. This beautiful necklace is hallmarked 925 on the pendant and chain. The chain measures approximately 18 inches and the pendant 20mm by 10mm. I do my best to take clear photos, as they form part of the description, each item is sold as seen. Boxes are for display purposes only unless otherwise stated but your item will come well packaged in a pretty organza bag, unless the item is too large! :) Unfortunately I only post within the UK. I list additional items every week so keep an eye out for more beautiful, quality pieces! Thank you for looking! INTERESTING CHAIN, WITH 2 OVAL PATTERNED PIECES. LOBSTER CLASP. FREE GIFT BAG. Ending 30 Apr at 8:55PM BST4d 21hCollection station availableMetal: Sterling SilverStyle: ChainLength: 18 - 19.99"
(Gold 9ct gold chain, marked 375 to the clasp, length. Treasure Trove Worcester is an antiques and second hand specialist based in Worcester. longcase clocks). 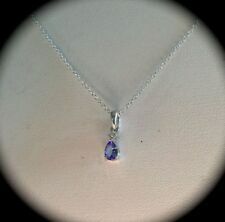 18k White Gold Pendant Set With A Pear Cut Tanzanite. Blue (With purple Hue). We can provide cash up to £10,000 within an hour and wire larger sums electronically within 24 hours. We have worked hard to develop a fine reputation as a high end Pawnbroker in the city of London. Deluxe Diamond Creates all Silver jewellery using high quality Special. All jewellery is regulated with UK HALLMARK Standard and therefore Hallmarked where Required by law. Custom Jewellery/ Diamond Viewing. Metal: Sterling SilverStyle: ChainLength: 16 - 17.99"
Necklace fastens with a spring ring clasp. White Diamond Information Stone Cut/Shape: Round. Item SKU: 6725. Wedding Anniversaries: 20th and 25th. Zodiac: Cancer. Birthstone: May. Length of Box Chain 18". Metal: Yellow GoldStyle: ChainLength: 18 - 19.99"
Ruby Information 1x Oval Cut Ruby - Stone Size: 5x3mm - Carat Weight per Stone: 0.289. 2x Oval Cut Ruby - Stone Size: 4x3mm - Carat Weight per Stone: 0.22. White Diamond Information Stone Cut/Shape: Round. 18CT HALLMARK. WEIGHT IS 3.3 GRAMS. Pre-owned 9ct Yellow Gold 0.15ct Diamond and Fire Opal Necklace CH838. Collection station availableMetal: Yellow GoldStyle: ChainLength: 16 - 17.99"
FOR YOUR CONSIDERATION IS THIS BEAUTIFUL LONDON BLUE TOPAZ & DIAMOND PENDANT. SET IN 9 CARAT WHITE GOLD, ON A DIAMOND CUT, INCRDIBLY SPARKLY WHITE GOLD CHAIN. Brand new beautiful 925 Sterling silver and diamond heart pendant with a 22" sterling silver snake chain. Comes in a blue velvet box. (I'VE PROVIDED THE SILVER CHAIN AND JEWELLERY BOX AS THIS IS THE ACTUAL PRICE OF JUST THE PENDANT) WAS £79.99. Absolute bargain and a beautiful gift. Made at the Birmingham jewellery Quarter. Marked 375 on the pendant and 9ct on the chain. In excellent condition. diamond natural Silver gold plated CWC. Dispatched with Royal Mail 1st Class. Completely made by rapid prototyping solids scape . One of lost wax casting one-of-a-kind piece. Gold plated silver natural diamond Wheel of fortune Clovis is a small jewellery brand run from the famous East End pub The George Tavern. HOT DIAMONDS SAYS As always, a real one point diamond is adorned for that extra touch of sparkle. Excellent quality solid 925 sterling silver feminine toggle style necklace with little hanging charms of a cross a heart and a square with each one having a genuine diamond in the center. Length 16" the width across the links is just over 4mm. Style - Necklace. Hot Diamonds. add to favourites. Whether you’re looking for an elegant pendant to share with a loved one, a one-of-a-kind accessory to add to your collection or even a piece of children’s jewellery, you’ll find it here. 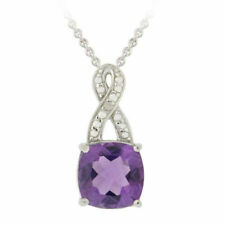 H Samuels Amethyst and Diamond Silver Necklace. Brand new necklace, excellent condition, and has never been worn! Perfect as a gift! Unfortunately I kept this in a jewellery box so threw away the original box - however I will post it in a jewellery box as displayed. Please be aware that this is from H Samuels NOT F Hinds, and box is just to keep it safe. Absolutely no marks or missing diamonds, excellent condition! Peridot 3.00ct.,Diamonds 0.40ct. and mini 15 Pearls Pendant Silver Gilt & 9ct. Solid Yellow Gold Chain. If a watch is still under a manufacturer warranty, but has less than twelve months remaining then we will top this up to twelve months. A highly polished 9ct white gold diamond and pink topaz 18" necklace, set with round cut pink topaz gemstones and dazzling diamond accents in a botanical leaf design. Hallmark – Full 9ct Hallmark. Size – 18". H Samuels Diamond Silver Necklace. Brand new necklace, excellent condition, and has never been worn! Perfect as a gift! Unfortunately I kept this in a jewellery box so threw away the original box - however I will post it in a jewellery box as displayed. Please be aware that this is from H Samuels NOT Elizabeth Duke, and box is just to keep it safe. Absolutely no marks or missing diamonds, excellent condition! Welcome to Jewelco London and thank you for visiting! A Very Pretty Moon And Star Pendant Which Is Crafted From Sterling Silver And Hand-Set With A Real Diamond Accent, Chain Length 14" With A 1.5" Extender. Complete With Beautiful Coral Satin Pouch And Matching Ribbon-Tied Gift Box To Make Your Gift Extra Special. Matching Earrings Available Gift Box, Pouch, Bag and Branded Polishing Cloth This product complies with Hallmarking Act 1973 Length: 15.